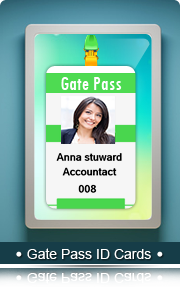 Visitor ID Gate Pass Software with advance features to design ID cards and gate pass for visitors and manage all visitor records in your organization. 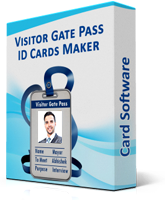 Visitor ID card designer software provides option to save all visitors details to database for future reference and facilitates to search particular visitor information according to Name, Company Name, Address, Phone Number, Email, Visitor Number, Data Range etc. Designed 'Visitor ID Card' using DRPU Visitor ID Card Maker and Gate Pass Software. Add visitor's details to the database: Provides facility to add your Visitors details to the database. Print Visitor ID Card: Option to print designed visitor's ID card with support to all major types of printers. Image Cropping Tool: To crop a single image or multiple images for Visitor ID Card and Gate Pass. Search any visitor's record: Provide option to view all saved visitor's records and search particular visitor's records according to Name, Company Name, Date Range etc. as per your requirements. Export designed ID Card: Using Export option, You can Export designed visitor's ID card As Image and As PDF. Camera Setting: Software provides option to take the photo of visitor using Camera for visitor ID Card. E-mail Setting: Software provides E-mail setting feature to send created ID cards at specified email address. 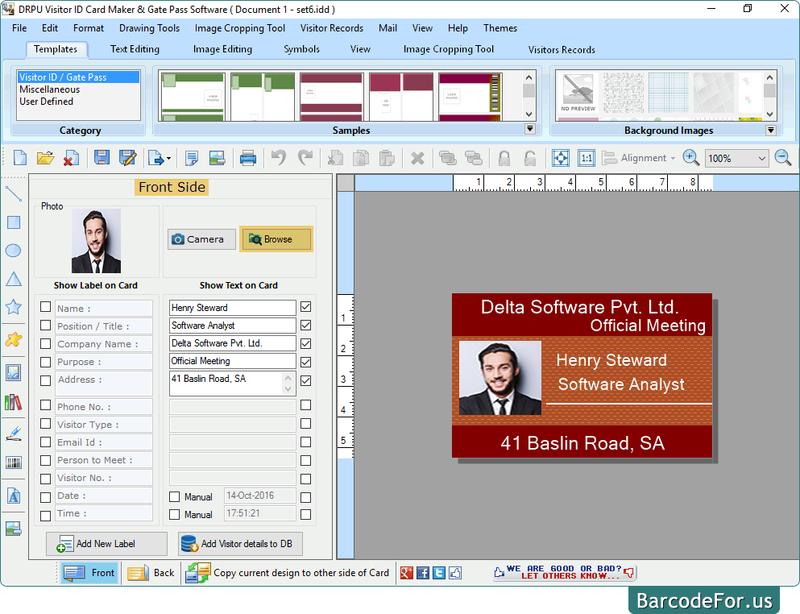 Advanced Image Designing Objects: Design visitor ID cards using Text, Line, Rectangle, Ellipse, Triangle, Star, Symbols, Signature, Barcode, Watermark and Images. Option to include text feature property and select image from library during ID card designing process.